What name will Jon and/ or Dany give to their child and why? I think it's an interesting topic to speculate about as we all know that names can have a lot of personal as well as political and historical significance in the world of ASOIAF. So do you think the child will be a boy or a girl (or do you think there'll be twins with one of each perhaps) and what name will it have? I liked the bogus leak from a few months back because the final episode ended with a young queen called Lyanna Targaryen. I could have lived with that. Eddard, if it's a boy. Eddard and Aemon if there are twin boys. I have no clue what a girl would be named...I, too, would certainly be okay with Lyanna. Why Eddard? I think it's obvious. But, Jon will initially struggle with Ned's decision. He may see it as something done to him instead of for him but once again, Sam will help Jon see that Ned's honor is still intact...more so than before, given the stakes he faced. He is Jon's hero. Why Aemon? He was a valuable mentor to Jon (Kill the boy and let the man be born). He trusted Jon's instincts and more importantly, allowed Jon to trust in himself. Bonus, he was a Targaryen, and while Dany never knew him, she would've been honored to do so...and likewise. 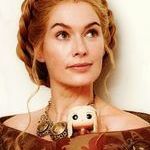 I think Daenerys would name her child Visenya if it is a girl. For a boy I have no idea Eddard maybe.